This article is about winners of the World Series of Major League Baseball that began in 1903. For earlier league and inter-league championships, see List of pre-World Series baseball champions. 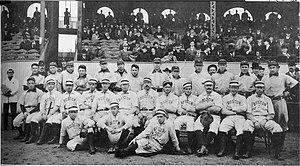 At the first World Series, held in 1903, the Boston Americans (front row) defeated the Pittsburgh Pirates (back row) in eight games. The World Series is the annual championship series of Major League Baseball (MLB) and concludes the MLB postseason. First played in 1903, the World Series championship is determined through a best-of-seven playoff and is a contest between the champions of baseball's National League (NL) and American League (AL). Often referred to as the "Fall Classic", the modern World Series has been played every year since 1903 with two exceptions: in 1904, when the NL champion New York Giants declined to play the AL champion Boston Americans; and in 1994, when the series was canceled due to the players' strike. The best-of-seven style has been the format of all World Series except in 1903, 1919, 1920, and 1921, when the winner was determined through a best-of-nine playoff. Although the large majority of contests have been played entirely during the month of October, a small number of Series have also had games played during September and November. The Series-winning team is awarded the Commissioner's Trophy. Players, coaches, and others associated with the team are generally given World Series rings to commemorate their victory; however, they have received other items such as pocket watches and medallions in the past. The winning team is traditionally invited to the White House to meet the President of the United States. A total of 114 Series have been contested, with the NL champion winning 48 and the AL champion winning 66. The New York Yankees of the AL have played in 40 World Series through 2018—winning 27—the most Series appearances and most victories of any Major League Baseball franchise. The Los Angeles Dodgers of the NL have the most losses with 14. The St. Louis Cardinals have represented the NL 19 times, and won 11 championships, second-most among all teams and most among NL clubs. Both the Giants and the Los Angeles Dodgers have appeared in more World Series, with 20 each. The Seattle Mariners and the Washington Nationals (formerly Montreal Expos) are the only current Major League Baseball franchises to have never appeared in a World Series; the San Diego Padres, Colorado Rockies, Texas Rangers (formerly the 1961–1971 version of the Washington Senators), Tampa Bay Rays, and Milwaukee Brewers (formerly Seattle Pilots) have all played in the Series but have never won. The Toronto Blue Jays are the only franchise from outside the United States to appear in a World Series, winning in 1992 and 1993. The Houston Astros have represented both the NL (2005) and the AL (2017), winning the Series in 2017. The current World Series champions are the Boston Red Sox. Winning team and losing team columns indicate the number of times that team has appeared in a World Series as well as each respective team's World Series record to date. No World Series due to a players' strike. In the sortable table below, teams are ordered first by number of appearances, then by number of wins, and finally by year of first appearance. In the "Season(s)" column, bold years indicate winning World Series appearances. The following are the 20 matchups of teams that have occurred two or more times in the World Series. All teams which have participated in these were "Classic Eight" members of either the American or National League; no expansion team (created in 1961 or later) has faced an opponent more than once in a World Series. T The 1907, 1912, and 1922 World Series each included one tied game. V The 1903, 1919, 1920, and 1921 World Series were in a best-of-nine format (carried by the first team to win five games). W Indicates a team which made the playoffs as a wild card team (rather than by winning a division). L1 The Brewers were in the American League from 1969–1997, after which they switched to the National League. L2 The Astros were in the National League from 1962–2012, after which they switched to the American League. ^ a b c d e "Baseball-Reference Playoff and World Series Index". Baseball-Reference.com. Retrieved November 5, 2009. ^ a b c "World Series Overview". Major League Baseball. Retrieved January 2, 2010. ^ a b "World Series History: Championships by Club". Major League Baseball. Retrieved January 2, 2010. ^ "History of the World Series – 1904". The Sporting News. Archived from the original on December 3, 2009. Retrieved September 27, 2011. ^ "Season interrupted". Sports Illustrated. August 26, 2002. Retrieved January 2, 2010. ^ "Phillies Announce World Series Trophy Tour Presented by Teva Pharmaceuticals and Comcast SportsNet". PR Newswire Association. January 9, 2009. Archived from the original on February 23, 2009. Retrieved January 1, 2010. ^ Lukas, Paul (October 30, 2009). "World Series rings, the real scoop". ESPN. Retrieved December 9, 2009. ^ "1903 World Series". Baseball-Reference.com. Retrieved January 2, 2010. ^ "1905 World Series". Baseball-Reference.com. Retrieved January 2, 2010. ^ "1906 World Series". Baseball-Reference.com. Retrieved January 2, 2010. ^ "1907 World Series". Baseball-Reference.com. Retrieved January 2, 2010. ^ "1908 World Series". Baseball-Reference.com. Retrieved January 2, 2010. ^ "1909 World Series". Baseball-Reference.com. Retrieved January 2, 2010. ^ "1910 World Series". Baseball-Reference.com. Retrieved January 2, 2010. ^ "1911 World Series". Baseball-Reference.com. Retrieved January 2, 2010. ^ "1912 World Series". Baseball-Reference.com. Retrieved January 2, 2010. ^ "1913 World Series". Baseball-Reference.com. Retrieved January 2, 2010. ^ "1914 World Series". Baseball-Reference.com. Retrieved January 2, 2010. ^ "1915 World Series". Baseball-Reference.com. Retrieved January 2, 2010. ^ "1916 World Series". Baseball-Reference.com. Retrieved January 2, 2010. ^ "1917 World Series". Baseball-Reference.com. Retrieved January 2, 2010. ^ "1918 World Series". Baseball-Reference.com. Retrieved January 2, 2010. ^ "1919 World Series". Baseball-Reference.com. Retrieved January 2, 2010. ^ "1920 World Series". Baseball-Reference.com. Retrieved January 2, 2010. ^ "1921 World Series". Baseball-Reference.com. Retrieved January 2, 2010. ^ "1922 World Series". Baseball-Reference.com. Retrieved January 2, 2010. ^ "1923 World Series". Baseball-Reference.com. Retrieved January 2, 2010. ^ "1924 World Series". Baseball-Reference.com. Retrieved January 2, 2010. ^ "1925 World Series". Baseball-Reference.com. Retrieved January 2, 2010. ^ "1926 World Series". Baseball-Reference.com. Retrieved January 2, 2010. ^ "1927 World Series". Baseball-Reference.com. Retrieved January 2, 2010. ^ "1928 World Series". Baseball-Reference.com. Retrieved January 2, 2010. ^ "1929 World Series". Baseball-Reference.com. Retrieved January 2, 2010. ^ "1930 World Series". Baseball-Reference.com. Retrieved January 2, 2010. ^ "1931 World Series". Baseball-Reference.com. Retrieved January 2, 2010. ^ "1932 World Series". Baseball-Reference.com. Retrieved January 2, 2010. ^ "1933 World Series". Baseball-Reference.com. Retrieved January 2, 2010. ^ "1934 World Series". Baseball-Reference.com. Retrieved January 2, 2010. ^ "1935 World Series". Baseball-Reference.com. Retrieved January 2, 2010. ^ "1936 World Series". Baseball-Reference.com. Retrieved January 2, 2010. ^ "1937 World Series". Baseball-Reference.com. Retrieved January 2, 2010. ^ "1938 World Series". Baseball-Reference.com. Retrieved January 2, 2010. ^ "1939 World Series". Baseball-Reference.com. Retrieved January 2, 2010. ^ "1940 World Series". Baseball-Reference.com. Retrieved January 2, 2010. ^ "1941 World Series". Baseball-Reference.com. Retrieved January 2, 2010. ^ "1942 World Series". Baseball-Reference.com. Retrieved January 2, 2010. ^ "1943 World Series". Baseball-Reference.com. Retrieved January 2, 2010. ^ "1944 World Series". Baseball-Reference.com. Retrieved January 2, 2010. ^ "1945 World Series". Baseball-Reference.com. Retrieved January 2, 2010. ^ "1946 World Series". Baseball-Reference.com. Retrieved January 2, 2010. ^ "1947 World Series". Baseball-Reference.com. Retrieved January 2, 2010. ^ "1948 World Series". Baseball-Reference.com. Retrieved January 2, 2010. ^ "1949 World Series". Baseball-Reference.com. Retrieved January 2, 2010. ^ "1950 World Series". Baseball-Reference.com. Retrieved January 2, 2010. ^ "1951 World Series". Baseball-Reference.com. Retrieved January 2, 2010. ^ "1952 World Series". Baseball-Reference.com. Retrieved January 2, 2010. ^ "1953 World Series". Baseball-Reference.com. Retrieved January 2, 2010. ^ "1954 World Series". Baseball-Reference.com. Retrieved January 2, 2010. ^ "1955 World Series". Baseball-Reference.com. Retrieved January 2, 2010. ^ "1956 World Series". Baseball-Reference.com. Retrieved January 2, 2010. ^ "1957 World Series". Baseball-Reference.com. Retrieved January 2, 2010. ^ "1958 World Series". Baseball-Reference.com. Retrieved January 2, 2010. ^ "1959 World Series". Baseball-Reference.com. Retrieved January 2, 2010. ^ "1960 World Series". Baseball-Reference.com. Retrieved January 2, 2010. ^ "1961 World Series". Baseball-Reference.com. Retrieved January 2, 2010. ^ "1962 World Series". Baseball-Reference.com. Retrieved January 2, 2010. ^ "1963 World Series". Baseball-Reference.com. Retrieved January 2, 2010. ^ "1964 World Series". Baseball-Reference.com. Retrieved January 2, 2010. ^ "1965 World Series". Baseball-Reference.com. Retrieved January 2, 2010. ^ "1966 World Series". Baseball-Reference.com. Retrieved January 2, 2010. ^ "1967 World Series". Baseball-Reference.com. Retrieved January 2, 2010. ^ "1968 World Series". Baseball-Reference.com. Retrieved January 2, 2010. ^ "1969 World Series". Baseball-Reference.com. Retrieved January 2, 2010. ^ "1970 World Series". Baseball-Reference.com. Retrieved January 2, 2010. ^ "1971 World Series". Baseball-Reference.com. Retrieved January 2, 2010. ^ "1972 World Series". Baseball-Reference.com. Retrieved January 2, 2010. ^ "1973 World Series". Baseball-Reference.com. Retrieved January 2, 2010. ^ "1974 World Series". Baseball-Reference.com. Retrieved January 2, 2010. ^ "1975 World Series". Baseball-Reference.com. Retrieved January 2, 2010. ^ "1976 World Series". Baseball-Reference.com. Retrieved January 2, 2010. ^ "1977 World Series". Baseball-Reference.com. Retrieved January 2, 2010. ^ "1978 World Series". Baseball-Reference.com. Retrieved January 2, 2010. ^ "1979 World Series". Baseball-Reference.com. Retrieved January 2, 2010. ^ "1980 World Series". Baseball-Reference.com. Retrieved January 2, 2010. ^ "1981 World Series". Baseball-Reference.com. Retrieved January 2, 2010. ^ "1982 World Series". Baseball-Reference.com. Retrieved January 2, 2010. ^ "1983 World Series". Baseball-Reference.com. Retrieved January 2, 2010. ^ "1984 World Series". Baseball-Reference.com. Retrieved January 2, 2010. ^ "1985 World Series". Baseball-Reference.com. Retrieved January 2, 2010. ^ "1986 World Series". Baseball-Reference.com. Retrieved January 2, 2010. ^ "1987 World Series". Baseball-Reference.com. Retrieved January 2, 2010. ^ "1988 World Series". Baseball-Reference.com. Retrieved January 2, 2010. ^ "1989 World Series". Baseball-Reference.com. Retrieved January 2, 2010. ^ "1990 World Series". Baseball-Reference.com. Retrieved January 2, 2010. ^ "1991 World Series". Baseball-Reference.com. Retrieved January 2, 2010. ^ "1992 World Series". Baseball-Reference.com. Retrieved January 2, 2010. ^ "1993 World Series". Baseball-Reference.com. Retrieved January 2, 2010. ^ "1995 World Series". Baseball-Reference.com. Retrieved January 2, 2010. ^ "1996 World Series". Baseball-Reference.com. Retrieved January 2, 2010. ^ "1997 World Series". Baseball-Reference.com. Retrieved January 2, 2010. ^ "1998 World Series". Baseball-Reference.com. Retrieved January 2, 2010. ^ "1999 World Series". Baseball-Reference.com. Retrieved January 2, 2010. ^ "2000 World Series". Baseball-Reference.com. Retrieved January 2, 2010. ^ "2001 World Series". Baseball-Reference.com. Retrieved January 2, 2010. ^ "2002 World Series". Baseball-Reference.com. Retrieved January 2, 2010. ^ "2003 World Series". Baseball-Reference.com. Retrieved January 2, 2010. ^ "2004 World Series". Baseball-Reference.com. Retrieved January 2, 2010. ^ "2005 World Series". Baseball-Reference.com. Retrieved January 2, 2010. ^ "2006 World Series". Baseball-Reference.com. Retrieved January 2, 2010. ^ "2007 World Series". Baseball-Reference.com. Retrieved January 2, 2010. ^ "2008 World Series". Baseball-Reference.com. Retrieved January 2, 2010. ^ "2009 World Series". Baseball-Reference.com. Retrieved January 2, 2010. ^ "2010 World Series". Baseball-Reference.com. Retrieved November 2, 2010. ^ "2011 World Series". Baseball-Reference.com. Retrieved November 2, 2010. ^ "2012 World Series". Baseball-Reference.com. Retrieved October 31, 2013. ^ "2013 World Series". Baseball-Reference.com. Retrieved December 19, 2013. ^ "2014 World Series". Baseball-Reference.com. Retrieved October 29, 2014. ^ "2015 World Series". Baseball-Reference.com. Retrieved November 1, 2015. ^ "2016 World Series". Baseball-Reference.com. Retrieved November 3, 2016. ^ "2017 World Series". Baseball-Reference.com. Retrieved November 1, 2017. ^ "2018 World Series". Baseball-Reference.com. Retrieved October 28, 2018. ^ "Brewers switch leagues, join Reds in NL Central". The Kentucky Post (Associated Press). E. W. Scripps Company. November 6, 1997. Archived from the original on May 5, 2005.